Cheim & Read is pleased to announce their first exhibition of paintings by Jonathan Lasker. Born in 1948 in Jersey City, New Jersey, Lasker attended the School of Visual Arts in New York and CalArts in Valencia, California in the late 1970s. He has shown regularly since the early 1980s. In 2003 a full scale retrospective of his work opened at the Museo Nacional Centro de Arte Reina Sofia in Madrid. In constructing his paintings, Lasker actively employs three basic elements: figure, ground and line. These elements are explored, assembled and positioned in terms of density, materiality, color and form; in heeding his given, self-set parameters Lasker investigates concepts of language, narration, and abstraction. His work intentionally presents the viewer with visual and conceptual contradictions, aesthetic paradoxes that question the mechanics of abstraction and the viewer's inherent identification with figuration. As Lasker writes: "I often think of my paintings as a form of image kit or perhaps as jigsaw puzzles, which offer components of painting as clues pointing the viewer, not to a finished narrative…but rather to a self-awareness of how one construes a painting." Lasker's paintings illustrate a collision between intuition and analysis, the subconscious and the premeditated. He first works out ideas for his paintings by freely sketching forms and compositions; these are navigated subconsciously, continuous and unmediated. These drawings are executed at a much smaller scale and often with several variations made before the final composition. The resultant study is then enlarged and copied as the final painting. Now highly conscious of his image, Lasker's scribbles become almost mechanically produced, his wandering line, now with destination, is copied, clarified and contained. As Lasker explains, "I reference the subconscious in a very conscious way. I take something from the subconscious and reprocess it. I go from direct subconscious mark-making to graphic reproduction." Distinctly different approaches to mark-making are arranged within Lasker's compositions-loose, tactile lines of thick paint are contradicted by smooth, flat-edged areas of graphic striation, as if painted textures did not share the same material substance but were instead collaged together from unrelated sources. Loosely rendered lines and amorphous forms separate spatially from flat grounds of vivid color or repetitive pattern; seemingly absent-minded scribbles infiltrate Lasker's strictly realized compositions. The contraposition and tension born from Lasker's uniquely paired elements confront more traditional readings of non-representational painting. Further, though Lasker explores the process of "figuration" in his work, he denies his abstracted figures a set time, narrative or pictorial structure-they intentionally reject reference to recognizable forms. 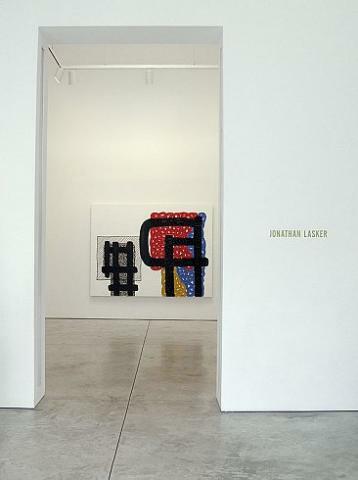 With this ambiguity, Lasker challenges the viewer's search for self-referential meaning. In a 2003 interview, he states: "My goal was to bring the viewer to the threshold of narrativity without crossing over, to bring the viewer to the state of pure pictoriality. Therefore I decided to use unrecognizable abstract forms as surrogate figures. This would convey the pure condition of being a thing in space."